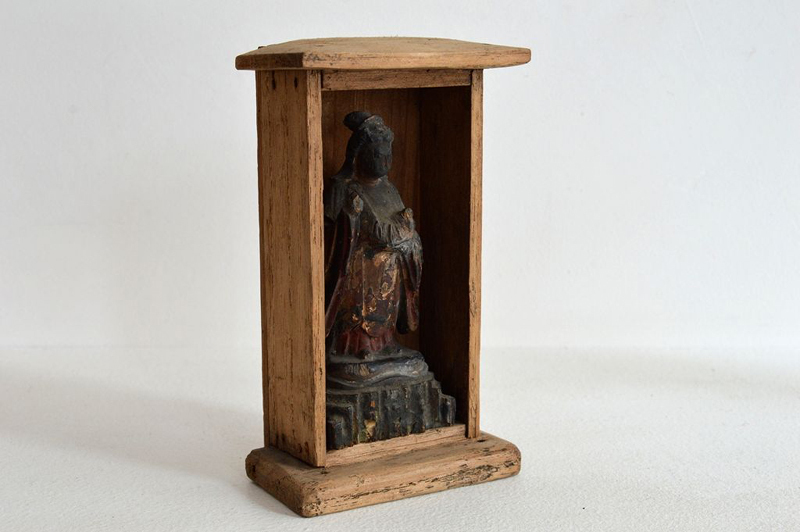 KISHIMOJIN (Dealer: titcoRet) – Buddhist wood carving figurine of ‘Kishimojin’ (‘Hariti’ – Goddess of childbirth and children), with an Indian-ink sign of ‘Namu-Kishimojin’ (Taking refuge in (‘Namas’) Kishimojin) at the back. Edo period, 19th century, Japan. Small piece and some aged deterioration as seen, but quite well-detailed carving with ‘hoju’ (precious stone) in the right hand and a child in the left arm. Attached with a ‘zushi’ shrine altar in the later years.